My next workshop will be organised for early summer (I organise 4 or 5 workshops each year). Details below related to my last workshop (left here to provide information). If you would like to be added onto my workshop emailing list to receive notification of new dates as soon as they are organised, please send me a message using the contact form above. 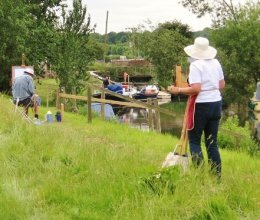 For my first workshop of 2019, we will be returning to The Hub, Bodiam to paint beside the River Rother - this time using it as a springtime subject. With many trees just beginning to show fresh new leaves and the riverside vegetation not fully re-grown, this time of year will offer us more light and better visibility of the river with lovely reflections. We will use The Hub as our base for free parking, pre-workshop meeting point, to buy lunch and use their facilities. Breakfast can also be purchased from 9.00am. Workshop time: 9.30am -to- 5.00pm. *Breakfast, lunch & beverages are not included in the workshop price. **Because we are weather dependent, I like to have a back-up/reserve date in the event of unsuitable weather. When you book please let me know if you would be available to attend on Thursday, 4th April (if 28th March forecast looks unsuitable for us). 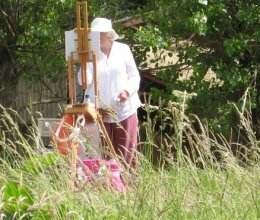 My workshops are suited to those who have some painting experience but are starting out with oils or those who would like to improve on existing oil painting skills while getting to grips with the challenges of working en plein air. My medium of choice is traditional oil paint and my teaching methods are based on their use, however, you are more than welcome to attend if you use water soluble oils. 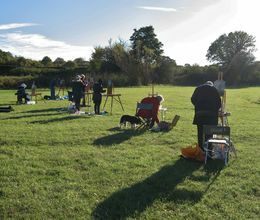 At the workshop you will learn how to find your subject; set up your easel to avoid annoyances and problems later on in the day; planning your composition; atmospheric perspective; colour mixing; application of oil paints and various useful tips to assist you with the demands of outdoor landscape painting. Students are required to bring their own equipment. If you would like to see the equipment list in advance of booking, contact me and I will email it over to you. I have a limited number of easels that can be loaned and for a very small additional fee traditional oil paints & some other materials can be provided. Please ask for details. To book or make further enquiries please send a message using the contact form on this website. If I have a choice of dates/venues listed, please indicate the venue and date you are interested in attending. Remember to include your email address. I will then reply to your enquiry (usually within 24hrs). When you contact me to request a place I will email you an information sheet with terms and conditions and a booking form for you to complete and return. Further dates are to be arranged this year. Please contact me if you would like to be notified of new dates/venues (if you attended a workshop with me in 2018 you will be on my workshop emailing list). Painting outdoors has its challenges but the rewards are so great - give it a go!